I just came across this article whilst reading some rss feeds. 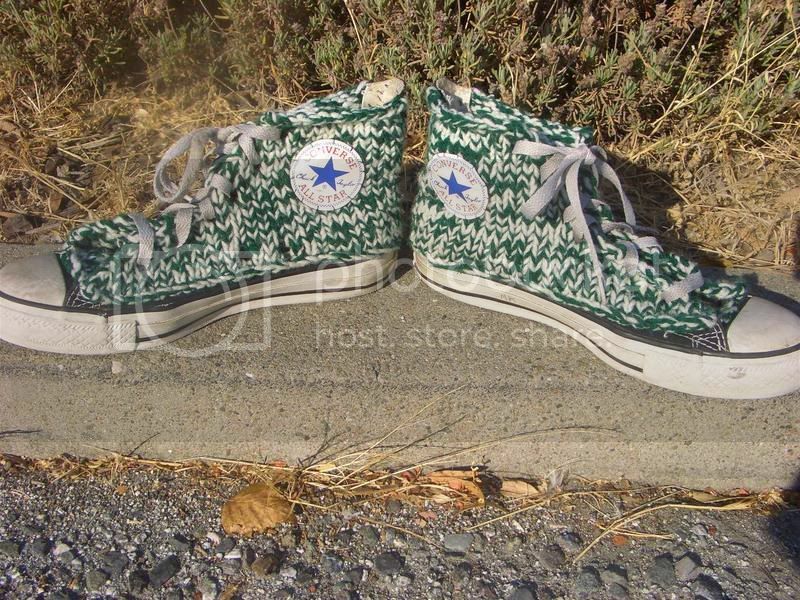 BlueAndRedCows on the craftster.org message board has posted a pattern for knitting converse shoes. apparently her old ones broke, so she replaced the fabric/canvas upper shoe with a knitted piece. they look great!! and seem to be really popular on the site also. Boing Boing's just posted an article about them also so I guess they'll be really popular soon! here's some photos of the final product. below is the pattern in case it's removed from the forum. http://www.craftster.org/forum/index.php?topic=120442.msg1154164#msg1154164 is the url of the original forum message if you want to read the whole thread. Journal of Interdisciplinary Music Studies is a biannually published, refereed journal. The journal covers the studies of music sciences, together with the studies of music and sound in the disciplines of humanities, social sciences, cognitive sciences, medical and engineering sciences. Our aim is to establish a wide range of interdisciplinary platform for the scholars studying on music and sound. Radical Musicology is a peer-reviewed online journal produced in the International Centre for Music Studies at Newcastle University (UK). It was established to provide a forum for progressive thinking across the whole field of musical studies, and encourages work that draws on any and all relevant discipinary and interdisciplinary prespectives. I haven't had much time to read all the emails lately, especially those on the videoblogging yahoogroups as there's so many to wade through. *** Individuals creating personal media of a new genre and form, not being controlled by big media, and not simply reproducing that which is traditional in big media, such as television and movies. *** Short, personal, not for profit, mostly non-fictional, video on the web. Snapshots of life. I like the succint definition - snapshots of life. I think this covers many styles of videoblogs, whether they be personal, art or more commercial as these are all facets of life. The other item I'd like to mention is the rise of collaborative efforts, or at least my participation in some collaborative projects. and a cool project from Susan was a collaborative video she made from video clips from 35 videobloggers who each chose one or more lines of the lyrics. people from all around the videoblogging world helped make the clips and Susan did a great job of combining them altogether. Create Digital Motion is a webzine and community site for VJs and other producers of moving images. Their audience can read the latest news, tips, reviews, and features on digital video production and performance. Create Digital Music is a webzine and community site for musicians using technology. Their audience can read the latest news, tips, reviews, and features on digital music making. As a change of pace from the usual, unfiltered product news, the site's indepedent contributors focus on ahead-of-the-curve tools, DIY music making, emerging trends, advanced software and experimental interfaces, gaming technology, retro 8-bit music, and other themes.